The training, though covering all the major banana diseases in the region, especially focuses on the Banana Bunchy Top Disease (BBTD).Staff from national research institutions and government bodies from Burundi, DR Congo, Kenya, Rwanda, Tanzania, Uganda and Zambia are being trained on recognition of disease symptoms in the field and disease confirmation using biotechnology tools in the laboratory. Participants are also being trained on spatial disease surveillance methods using Geographical Positioning Systems (GPS) and the development of Geographical Information Systems (GIS) maps showing the presence and spread of the diseases. Hein Bouwmeester, IITA Geographical Information Systems (GIS) expert based in Tanzania, is facilitating this section of the training. The workshop forges links between ongoing and planned surveillance activities for Banana Xanthomonas Wilt (BXW), another deadly disease, to create a regional disease surveillance network. Dr Fen Beed, IITA Plant Pathologist and coordinator of the training, says that BBTD and BXW are of great concern because they are easily transmitted through infected planting material and certain insects. As no banana varieties are known to be resistant to the diseases, all familiar banana types - cooking, juicing, dessert and plantain - are in danger of being wiped out if urgent action is not taken. Beed adds that the training concentrates on the seven countries because there have been reports of the presence of BBTD or they are at high risk of contracting the disease from neighboring countries. For instance, he says, southwest Uganda is in danger of getting BBTD as the disease is present in northern Rwanda and eastern DR Congo. "Where a disease is not yet present but is likely to be introduced, an effective surveillance system increases awareness of the disease symptoms and the chances of the disease being reported by farmers and their representatives when it does arrive" he explains. "Early detection permits destruction of infected plants to prevent disease establishment and spread." He adds, "where a disease has been reported and confirmed, the use of GPS-linked spatial surveillance helps to specify its presence across a targeted region. It determines whether only a single plant is infected, or one small area, or across the region." BBTD is a viral disease that results in narrow bunched leaves and stunted fruitless plants, which eventually die. It is very difficult to identify in newly infected plants and is often missed by farmers and government agencies in the region resulting in its unabated spread. Banana Xanthomonas Wilt (BXW) is a bacterial disease that causes yellowing and wilting of the leaves, uneven and premature ripening of the fruits and eventually, the plants rot to their death. 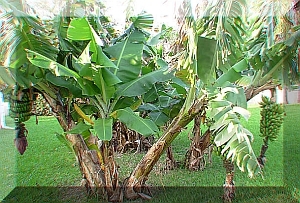 The symptoms are often confused with those of the panama disease and nutrient deficiencies. The training is organized by IITA in collaboration with the Rwanda Agriculture Development Authority (RADA) and the Rwandan Agricultural Research Institute (Institut des Sciences Agronomiques du Rwanda - ISAR), and funded by the United Nation's Food and Agriculture Organization (FAO). It runs from 25 to 29 January 2010 in Kigali, Rwanda. Following the training, the participants will carry out a series of targeted surveys to establish the distribution of BBTD, funded by FAO.